National Throw Out Your Old Vacuum Cleaner Week! 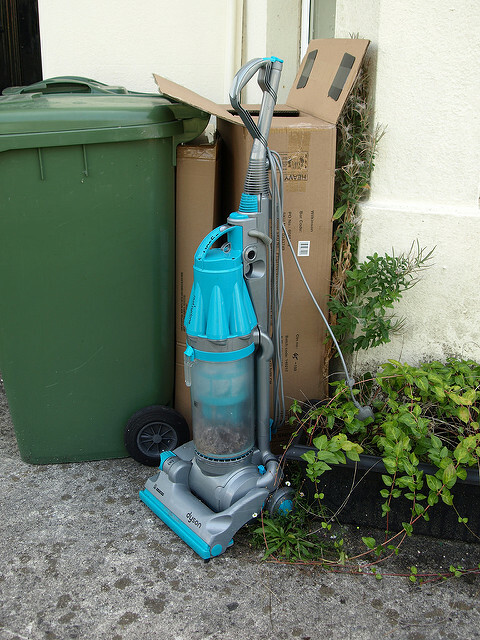 By all rights the week after Christmas should be declared "National Throw Out Your Old Vacuum Cleaner Week" because it is the time when they get trashed. 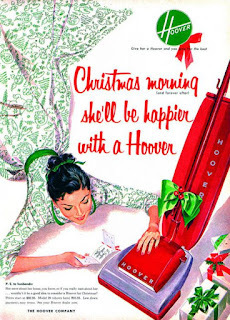 It is an American tradition that literally, tens of millions of perfectly good vacuum cleaners are tossed and kicked to the curb every year when they are replaced during Christmas with a new shiny model. While it might not be considered a romantic gift a new vacuum falls into the practical category and the purchase is often justified based on complaints that the old unit is on its last leg and not worth fixing. Snazzy marketing and what looks like ever falling prices on what had previously been labeled as deluxe features add fuel to the drive and endless pursuit to become the proud owner of a better vacuum. In a land where consumerism is a way of life, a new vacuum model is always arriving at stores sporting claims it is better, stronger and more reliable. In truth, the changes are generally very minor such as boosting the coolest new color and a cord that is longer or easier to manage. With a fresh supply of new fairly inexpensive models always hitting the store shelves it is little wonder simply junking the old unit has gained a great deal of appeal. New vacuums also tend to be chalked full of new features all pointing to one thing and that is cleaning will soon become a fun task rather than a drudgery that you seek to avoid. Anyone who knows anything about appliances can quickly make the argument the lowly vacuum cleaner may be the most abused of all household appliances. While a new vacuum brings a smile to those who pull these sparkling new toys out of a box this does not deter them from continuing their old habits and they quickly return to heaping misery upon their new article of joy. In many ways, manufacturers are responsible for much of this and should hang their heads in shame for promising too much or delivering too little. 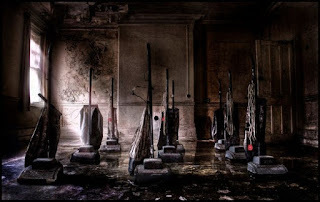 It is not uncommon for vacuums to soon suffer insults and mistreatment. Simply put, a vacuum cleaner should be ready for a life of no respect. To make matters worse when it comes to maintenance and repair, vacuum cleaners usually require high technical knowledge which has grown more complex with time. Most people find that trying to have an old unit serviced is often more trouble than it is worth. Unfortunately, the directions that accompany a new vacuum are easy to ignore once the unit is plugged in and the user becomes hypnotized by its roar. The hell with the idea large objects should be picked up rather than vacuumed up, whether because of laziness or carelessness far too many things such as dimes or small screws tend to be cruelly sucked up into these units. Almost as heartbreaking is the way dust carpet odor killer designed to mask smells rapidly excels at plugging vacuum filters, if not that it is the massive amounts of pet hair that take a toll. This time of year it is not uncommon to find a vacuum plugged with needles from a Christmas tree, this is something they were never designed to pick up. An extra switch that fails can render an expensive machine useless, finding the right belt or if needed a bag can also be a challenge. The bottom-line is most units can be fixed and their lives greatly extended with a little TLC but when it comes to this appliance such care is often in short supply. Whether because of changing demand or as a part of a plot to render older units obsolete manufacturers of vacuum cleaners constantly change models making parts expensive. They also seem to have some of the worst websites known to man, not only are they difficult to navigate but they make information about parts nearly impossible to get. The real truth is when features are added most units become far to complicate to function well and tabs and parts begin to break just after the warranty runs out. This should not be a big issue to most consumers because the warranty almost always fails to cover abuse and this is the reason most vacuums fail. It should be noted that many people really don't vacuum as often as they should so the warranty period seems to fly by while the unit sits idle. Footnote; Out of all the vacuum cleaner articles published this holiday season I personally want to thank you for reading mine. As a contractor and as a Landlord I witness a great deal of waste and see many things abused and discarded long before their time. Because of my concern for the environment, I cannot help but be saddened that we live in a world where resources are so often squandered. Feel free to forward this article to a vacuum cleaner abuser near you. German-born theoretical physicist, Albert Einstein developed the general theory of relativity which remains one of the two pillars of modern physics alongside quantum mechanics. In 1905 with the theory of special relativity Einstein proved that the laws of physics are the same for all non-accelerating observers, and he showed that the speed of light within a vacuum is the same no matter the speed at which an observer travels. As a result, he found that space and time were interwoven into a single continuum known as space-time. Events that occur at the same time for one observer could occur at different times for another. This geometric theory of gravitation has stood the test of time and remains the current description of gravitation in modern physics. The definition of relativity is based solidly on the relationships or values determined by the laws of nature. Often we find the qualities of relativity extend to other parts of our lives and the universe as well such as economics. While mankind has developed certain ways to temporarily mask and confuse the truth, be assured that certain relationships should be considered the norm, history has shown time and time again that after we deviate from the so-called norm things tend to revert back to what has been established as a baseline. This is important because we exist in a world where the state of real value is always dependent on, or determined by a commodity or an item's relationship to something else such as supply or demand. Because investing in tangible assets often is accompanied by drawbacks such as high "entry or exit" fees or at risk of being damaged and ravaged by time, we find that money or currencies have become the way most people tend to place a value on tangible items. When we talk about tangible items we are referring to the touchable, material, or the physical and real world that surrounds us. An issue that should not slip by unnoticed is that both debt and a number of paper assets has grown massively over recent decades and especially in recent years. The material world of tangible items by its nature has been far more restrained in its growth, in short, the amount of tangible goods has not matched the growth of paper assets. This is key to understanding the true risk of inflation going forward! Considering just four currencies constitute the bulk holdings representing the wealth of the world it is logical to look for a relationship between them to determine relative value. Assuming all other factors remain the same we then find that if the central banks controlling these currencies move in lockstep their values to each other should remain "relatively" constant moving within certain limits. Overall that has been the case even if a person were to argue otherwise and point to moves occurring over years. A generally accepted fact is a great deal of the value of "cash" is derived from a very important quality which is frequently forgotten, having cash which is relatively stable compared to many commodities and tangible assets translates into liquidity and flexibility to exploit opportunities. This means the holder of cash has an effective option to purchase more volatile assets if and when they become cheap. Thus, a willingness to hold cash has often been the simplest way to take advantage of markets in flux. It is important to remember the global currency system world leaders have created is fairly closed. By this, I mean relative value merely shifts back and forth between the four major currencies that dominate the system with little ability to escape. The crux of this is the term "escape" in that wealth flowing into these "paper symbols of wealth also known as fiat money" often finds resistance into converting back into tangible assets. As pointed out above holding tangible assets has drawbacks which most people find difficult, confining, or somewhat limiting. The fact that tangible assets carry the negative attribute or quality of having to be insured, maintained, or at risk of being visibly and physically by time tends to reinforce the illusion currencies and paper assets are more desirable and stable than they really are. The benefit of a currency system that accommodates trade, and easily allows the exchange of goods and services has come to outweigh reality and truth in value discovery. In many ways, currency can be considered a commodity and problems develop when governments and central banks overreach and break the link of trust and faith. Central banks don't want us to see they have designed and put in place a false market that is more or less "fixed within limits" and not a rapidly "self-adjusting" system. All is well until it becomes clear to the masses they have been deceiving as to the real value of our currency. When the bond of faith is broken major conflict arises because central banks will be punished as fiat money is shunned. The "master key" to our currency system is stability. Those in power have created the myth the currency balance can be maintained and that no currency of a developed nation can fail. All this is important because the "perceived value" of money and currencies holds great sway over what something is worth and its value. Recent claims that a false economy has disrupted the forces of true price discovery make this very important if you believe we will eventually convert or return to the norms of the past. 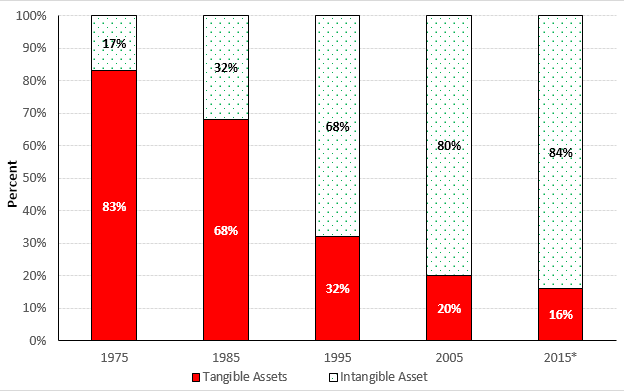 I continue to believe the primary reason that inflation is not more prevalent is that society is pouring such a large percentage of wealth into intangible products or goods, this is because physical assets are often difficult to protect and oversee. This imbalance is a red flag that a readjustment period may soon occur. If faith drops in these intangible "promises" and wealth would suddenly shift into tangible goods seeking a safe haven inflation could soar. Like many of those questioning the ability of Modern Economic Theory to control the cycles of boom and bust, I worry about the massive debt being accumulated by governments and the rate that central banks have expanded the money supply. Those touting a deflationary scenario tend to focus on the idea the forces of unpaid debts would massively depress prices. In fact what we may see develop is a battle of these two forces, however, I want to point out it is important to remember that debts can go unpaid and promises left unfilled which creates a massive problem in predicting how an economic crisis will play out. As we have seen from the economic crisis of 2008 and following many other unsettling developments legal actions can continue to drag on for years. While the legal system ponders solutions chaos can assault markets. Major disruptions can result from major shifts in value and even more so in the world today where derivatives lurk just out of sight waiting to wreak havoc on our far too fragile economic system. One fact remains front and center and that is unstable currency markets can be a precursor to massive shifts in value and a sudden drop in confidence. It is logical to think that in such a situation many of the super-rich insiders will again be the big winners. Feeding into this mix are opinions such as Jeremy Grantham's recent take on bubbles and his thoughts that we may only revert partway to what we consider the norm and that may be over many years. He suggests the current market may end in a whimper rather than a bang. He mentioned seeing the election of Donald Trump as an outlier event with possibilities of tariff wars and general global political uneasiness to follow the surprise rally we have seen. Overall his view of what lies ahead is not all that jolly and he concedes that 15% to 25% bear markets can always occur. He also states that the probable "mean-reverting" paths he envisions will not bode well for pension funds at others looking out towards a 20-year horizon. On occasion, it is good to take a deep breath and evaluate just where you are and where you are headed. Revisiting the list of the world's ten most crucial problems counted down from "least to most crucial" shows little has changed since November of 2013 when this list was first composed. We should not be overly surprised that problems impacting the "shape of our lives' as well as our very existence dominate this list. When composing such a the list the term "most crucial" is very subjective, meaning that it depends greatly on an individual's interest and priorities. In the diverse world in which we live today, it is clear consensus is impossible to find and views can rapidly change. Below is a list of the world's ten most crucial problems counted down from "least to most crucial" The world must begin to address these many problems with long term solutions. Most of these are issues that center on our sustainability. Sadly, politicians do not deal well with such things leaving mankind without a great deal of direction. As we look at the human condition we can let fate take us where it may choose or we can take control of our future by proper planning and by guiding it as best we can. Remember the position a problem holds on this list can shift from time to time as events take place, but expect most of them to remain on the list. Unless a black swan event such as a meteor heads our way this is what you have. Some problems have been grouped with the collateral issues associated with them, this may include the current "buzz words" used to describe their importance. Different people would group these issues in a variety of other ways and move about their priority. As always your comments are welcome. 10. Demographics of an aging population; As the population grows older euthanasia and the quality of life will become an issue. This must be handled in a fair, honest, humane, and compassionate way. The alternative is to simply let many older people wither and die hungry while existing in pain and squalor. 7. Income inequality and economic stability; The uber-rich should not become exempt from all common woes and untouchable. The uber-rich and politically elite should not comprise a special class who are immune and able to ignore the rules of society. Nor should the masses be placed into a situation where they are deemed deserving of what fruit society creates merely by being born. Fairness in handling the world's economic systems and currencies that allow for a solid way to exchange goods and services is necessary or other world support systems will suffer or fail. 6. Man's inability to take control of his future by creating responsive and responsible governments; The masses have been lulled into complacency, in many ways we are all slaves, this is not a new role for man. But we can think and should make an effort to do so, we must push our chosen leaders to do the right thing and make long-term plans that are sustainable. We must shape our future and the values of the society in which we live. 5. The last few years stand as proof of man's cruelty to man. Strife between religions and tribes must end; We need to develop a new tolerance that allows people live in peace. A safe place to live for a person and their family is one of man's most basic needs. The political elite must not be held harmless for the grief and death they cause over large swatches of mankind. War crimes cannot be tolerated. While this is easy to say deciding exactly who is responsible for these crimes is often easier said than done. 3. Wasting our natural resources by not conserving and the continued destruction of our environment; I contend that many of the "green solutions" being proposed such as ethanol fuel are not a solution at all and just ways for business to profit. A solution is not truly green unless the environmental cost of "maintaining" it is very low. 2. Pollution and the resulting climate change it may bring; This is showing up in oceans that are sick and being depleted of life. This also may result in rising oceans and crop failures. Either scenario will mean massive suffering across the world and could tear the social fabric and alter our day to day lives. 1. Overpopulation; This is the overriding problem facing Earth and the most difficult to address. If the problem of overpopulation is not addressed all the other problems on this list will most likely become much greater. Many people still rejoice in the idea that we should be "fruitful and multiply" ignoring or oblivious to the problems it creates in the long-run. The quality of life in many ways is more important than quantity. In my book, Advancing Time I highlight and bring focus to the massive changes that have taken place over the last two hundred and fifty years. History viewed in the framework of man's time on Earth forms the crux of my perspective. The oldest fully developed humans based on DNA research supports the theory that Africa was the area man first inhabited between 200,000 and 140,000 years ago. In 1800 the population of the world was around 900 million, by 1900 it had soared to 1.6 billion, since then it has exploded to over 7 billion. When you chronicle the journey from the beginning of man to our current state it becomes clear that the world has never before experienced such rapid change. This perspective helps us make sense of our fast changing chaotic world while illuminating and clarifying the responsibilities society faces. It is important we recognize this ever-quickening pace of change and keep in mind that if these problems are not addressed there may be no future for mankind or it may be much shorter and difficult than many people expect. 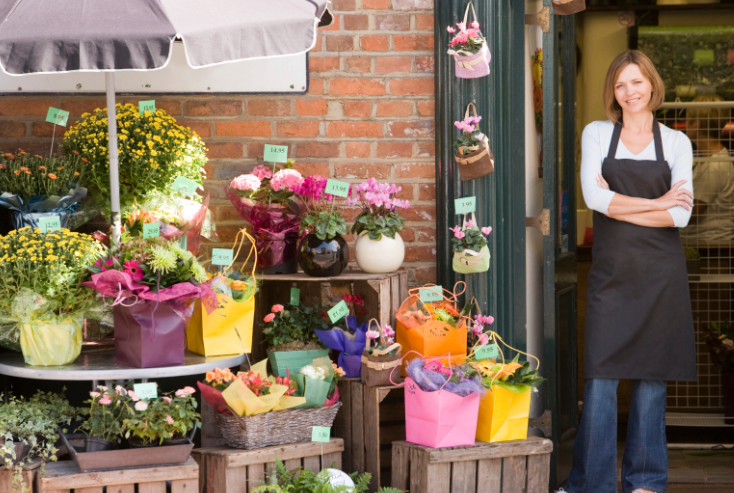 One group of Americans that seem solidly behind the new President and are hoping to see something positive occur are those engaged in operating a small business. 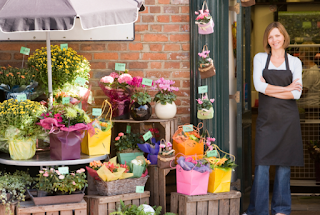 The Associated Press recently reported a surge in the confidence of small business owners much of it is based in the belief Donald Trump will focus on issues important to them as business owners. Once the backbone of this country businesses with two to ten employees are becoming an endangered species. The family business has been under assault from the unintended consequences of the many laws and mandates passed in recent years. Inspections, a plethora of permits, licenses, taxes, insurance requirements, and regulations make it almost impossible for a small business to open, compete, and operate legally. Big government has become toxic for small business. Today very few Americans are actually able and willing to risk capital and try to meet a payroll. This is because it often means they have to buy health insurance for their workers, lease an attractive site, maintain business licenses, observe myriad obscure regulations while creating a market that makes economic sense. This puts a target on their back requiring them to innovate and compete with cutthroat competitors. While doing all this they are also asked to meet disability access standards, remain on call 24/7 for any business emergencies, and stay up late into the night trying to juggle interests of employees, business, and community. There is a solid reason why today only 2% of all Americans actually employ at least one non-relative employee. The owners of small businesses are burdened with spending countless hours trying to comply with the red tape rather than in earning a living. According to the Small Business Administration only 10% of Americans own a business and 80% of these are single self-employed businesses. The remainder of Americans busy themselves with demanding jobs that will return more for less effort, they seek jobs that will provide higher than average wages, a full complement of generous benefits and frequent paid holidays. Most also seek a definite work day without after hour calls or responsibilities. America has become not so much a capitalist society as a worker's society demanding socialist protections, this is a large part of why America appears to have lost much of its competitive edge. Though usually denied by government employees, jobs in Government often pay better and are less demanding than those in the private sector. Many government employees also are also protected by unions and work rules that provide them with security and generous benefits that small business and much of the private sector do not enjoy. As a result of this reality, it is not uncommon that a vast number of talented workers prefer to slip into dead end paper shuffling bureaucratic jobs rather than set out on the path to becoming an entrepreneur. It has been said that money is the mother’s milk of politics, this in many ways has been the Achilles heal of small business. The lobbyist that represent banks, big business, and special interest have had their way to the detriment of America and small business. They have shaped and crafted regulations that have shifted commerce strongly in their favor. As the stocks of large companies rise we are often oblivious to the names of local businesses that cease to exist. Even as many small businesses try to carve out a niche they can defend against the giant retailers down the street they must also compete against exploiters like Amazon that have no brick and mortar presence and also benefit from avoiding local and state sales tax. Years ago America was faced with the question of whether bigger is better as Wal-Mart expanded across the land. Wal-Mart and other big box stores proved the advantage of size which allows for whole departments to specialize in dealing with Government regulations that have become the bane of the small businessman. The sad truth, while efficient in distributing goods these behemoths diminish cultural diversity and alter the fabric of society. The jobs they offer neither fulfill or excite, few people grow up filled with the desire to work at a big box store like Wal-Mart or in an Amazon warehouse. My point is that small business and entrepreneurship are key in making America great again but the sad truth is that beyond the Lemonade Stand of childhood few Americans know anything about running a business. Running a business in America is complex and requires knowledge and smarts, if we want to create more jobs Government must encourage small business formation by slashing through the regulations, simplifying, and removing the burdens that make it so difficult. Government can do a lot to equalize the playing field between small businesses and their larger brethren but it should be through well thought out policies. We have to decide what kind of communities we really want to live in and if America is going to remain a land of opportunity. The Chinese Academy of Social Sciences has forecast China's economic growth will further slow in 2017 to 6.5 percent, this would be the slowest pace in more than 25 years. Chinese leaders are struggling to clamp down on asset price bubbles, especially in the property market while a sharp drop in the yuan has fed fears of markets turmoil. Heightened anxiety about the yuan has caused it to slid to the lowest level in over eight years last month because of continued capital outflows following Donald Trump's U.S. election victory. All this is occurring just as a rapid rise in bank lending, a dangerous build-up of debt in the corporate sector and a property market that has failed to fully flush out speculators are threatening to derail the economy. China is far too large and impacts the global economy to where we can not discount its importance. The great capital unwinding is continuing as money that has flowed into China for decades attempts to leave and take with it much of the wealth it has produced. Interestingly many people fail to understand how the massive capital flows leaving China are distorting both currencies and economies throughout the world. In fact, many economist and investors are in a state of denial as to the magnitude of the problem and just how dire the situation has become. We still hear the faithful tout how China is still cranking out around 7% growth and how the country will be able to navigate from an export based to a consumer driven economy. I contend China is in far more trouble than most people imagine and the reason it has gone unnoticed is because of the control their government has over the economy which makes it impossible to get accurate or specifically detailed numbers and information. The opaque nature of China's economy makes it difficult to gauge what is really happening in the most populous country in the world. The fact that its economy, media, and internet are all controlled by its government curtails getting real information and unbiased data. An "all growth is good" mentality that always included "building more and expanding more" has been China's mantra for years as politicians were rewarded for generating growth. The combination of these factors has created the gigantic credit trap that China now finds itself in. Political tinkering with economic data has produced a lack of clean and precise numbers when it comes to the economy, and this is not likely to change anytime soon. It often seems the only way the world would know the wheels had fallen off the economy in China would be if tens, or even hundreds of millions of Chinese hit the streets in protest but that is unlikely and would go against core values of the Chinese people, China has heavily discouraged such actions for decades. Over the years corruption has flourished in China because politics and greed are so closely related. As a result, the growth of credit has gone unchecked. It is the nature of political systems to mask their flaws and in the case of China years of rapid growth have made this easy. It is important to remember that much of the growth in China after 2008 came from a massive 6.6 trillion dollar stimulus program. This expanded credit and poured massive amounts of money into the system, but it also encouraged expansion and construction with little regard as to real demand or need. When critics and those who see the economy of China as containing major defects have made efforts to voice their concerns and point out weaknesses in the system they usually are drowned out by those touting the message that China is a case of potential unleashed. Even today while many people concede that growth has slowed they still refuse to recognize just how much of past growth has been constructed on a foundation of sand and the misallocation of capital. The recognition of this is written not to diminish the accomplishments of China or to question their progress, but to point out much of what we have witnessed is the result of one-time factors that have largely played out. Several factors have drastically changed politically, socially and from a military perspective since the days when America fueled China's growth. Recently, what many Americans viewed as a beneficial relationship has deteriorated into something akin to fear or resentment. Many Americans have grown troubled by China's "new military swagger" now flowing out of Beijing. This coupled with a massive loss of American manufacturing jobs, the theft of intellectual knowledge and our massive trade deficit with China has caused concern. We must remember Beijing has been hit by the perfect financial storm as forces from a closed capital account, independent monetary policy, and a tightly managed exchange rate all have decided to plummet the economy at the same time. It is time for those who have tried to ignore the growing problems to understand that one of the least painful ways for China to confront its woes will be to shift them off to other countries. Selling products below production cost is an example of such a policy. This has allowed Donald Trump to talk during the election about proposing a tariff as much as 45% on Chinese goods flowing into America. The lack of clean economic numbers combined with an intentional transparency issue has created a "guessathon" where we are forced to scan the latest pricing on what cargo ships are charging and how busy ports across the world appear to be in an effort to determine what is really happening. A big problem is that an "economy" by its nature can easily trick, hide, or mislead us as to what is occurring. We are often caught off-guard by what is happening off-stage or festering in the wings. Reality is often obscured without effort, but when a government is in full propaganda mode in an effort to reassure its people that all is well it can become impossible to see through the fog. This means we must really hunker down and go to a lot of work to get the truth. Four big state-owned commercial banks and other mainly state-controlled banks account for nearly all official lending in China and their customers are largely state-owned firms. This has left little room for private banks and this means informal lending in China has grown rapidly over the past five years and even local governments borrow from the shadow banks. Today the shadow banking sector is estimated to make up 20% of all loans. This is only one of the problems that has developed and skewed China's development as the government controlled the economy from behind the curtain. 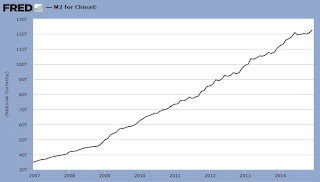 For years the people of China have had the habit of saving much of what they earn but the low interest-rates paid at banks has not rewarded savers, this is reflected by growth in the shadow banks and the fact much of their money has drifted into a bizarre housing market where prices are sky high. 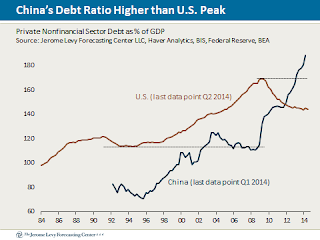 China is in a situation similar to what America faced in 1929 following a period of rapid growth and credit expansion. 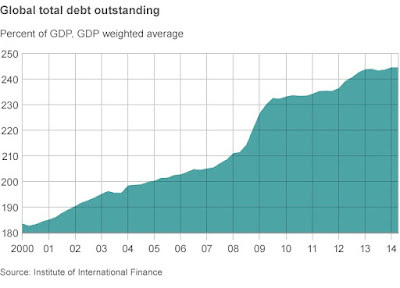 For years credit expanded rapidly in China, and now much of the country is mired in debt. As Beijing pursued a strong yuan policy pegged to the U.S. dollar. Since 2005 the yuan has appreciated about 30%, this profited those who put money in China, but now that the economy of China has become very shaky a lot of investors are questioning the risk of holding yuan assets. Now the country is experiencing massive capital outflows as several events and the pain of attempting to hold its currency peg to the U.S. dollar finally became unbearable. The PBOC is under tremendous pressure as the responsibility of holding this mess together rest solidly on their shoulders. A massive scheme for the state to buy stock shares to halt a falling market while dealing with near bankrupt municipal authorities is only part of the woes they face. It is clear the economic efficiency of credit has started to collapse in China and the unwinding of its giant credit spree looks to be very painful. For years it has always been thought that China’s current-account surpluses have fueled its huge money-supply growth within a largely pegged currency. As foreign exchange piled up, the People’s Bank of China continued to print more yuan. According to estimates, China’s banking system has grown from $10 trillion to $24 trillion since 2008, but now the reverse appears to be happening, and as the yuan weakens, the central bank will effectively have to buy its own currency using foreign reserves to maintain its peg. This could mean the external trade position would now cause the central bank to shrink the domestic money supply. 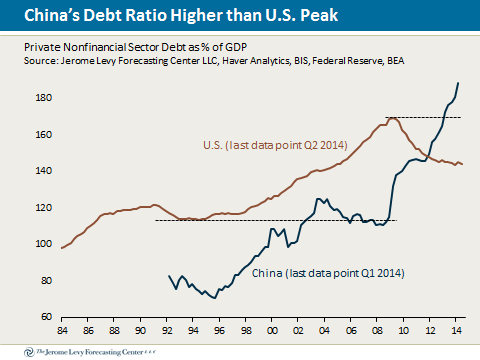 Beijing will need to get used to the market forced deleveraging and slower growth. All this plays into the view we all going to witness an overall deterioration that makes it logical for investors to get out of both the yuan and China. Expect to see a continuation of wealth leaving China and fleeing towards safety. Footnote; As always comments are welcomed and please feel free to scan the archives for other articles that may interest you. Below is another article concerning how China is failing to achieve real reform. Thoughts On "This Time Is Different"
Efforts to justify the most recent market melt-up following the election of Donald Trump are sometimes difficult to comprehend. If memory is correct the general consensus only a few months ago was that such an event would spell certain doom for both the economy and markets in general. Prior to the election, too many articles to count, appeared in the mainstream media denouncing his proposed solutions to America's problems. Wall Street made clear their choice was not to venture down the risky path he proposed and sided solidly with extending what was considered the tried and true course set by our current leaders. A read of the pdf file rather than the 2009 bestselling book titled, "This Time Is Different" did little to convince me that this time is different unless you are talking about a few degrees or details. It seems it is always different but sadly, it always ends the same way and that is in default. The book written in 2009 by Carmen Reinhart and Kenneth Rogoff chronicles eight centuries of financial follies in which financial meltdowns have typically followed real-estate bubbles, rising indebtedness, and gaping deficits. Despite what those enthralled with our newfangled Modern Monetary Theory, also known as MMT, continue to claim, many of us still question just how well debt cycles can be managed. Simply stated, we do not believe such policy will allow us to avoid the ugly results of the past. The charts contained in the working file were frightening and a strong reminder that debt has consequences. 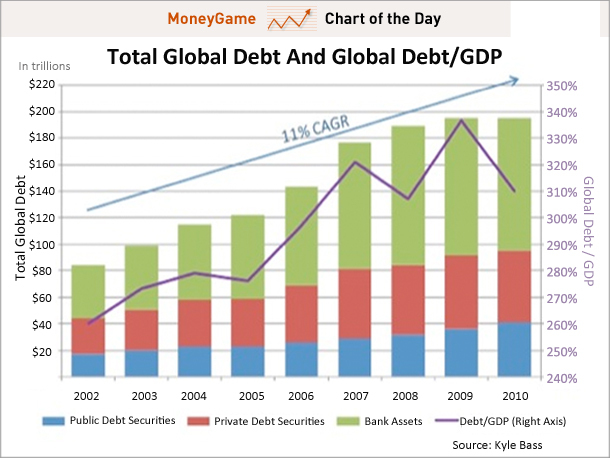 One thing that came across as you read the file is that a clear pattern and similarity exists between many of the defaults that have occurred throughout history and the situation developing today as we see debt now growing at an incredible rate across the globe. The economic theory of MMT details the procedures and consequences of using government-issued tokens as the unit of money, i.e., fiat money. According to MMT, "governments with the power to issue their own currency are always solvent which means they can afford to buy anything for sale in their domestic unit of account even though they may face inflationary and political constraints". In short MMT enthusiast feel empowered to avoid future crashes. Of course, looking the vast amounts of historical data on the past financial failures that have taken place we naysayers voice reason for concern. The failures and meltdowns that are chronicled include state failures, bank crisis, currency crashes and destabilizing outburst of inflation. Several interesting points leaped out to me while I was reading the file. One concern was the strong link found that indicated countries experiencing sudden large capital inflows are at a high risk of having a debt crisis. The preliminary evidence over a much broader sweep of history suggests this is often the case and surges in capital inflows often preceding external debt crises at the country, regional, and global level since 1800 if not before. Also, periods of high international capital mobility have repeatedly produced international banking crises, this is not only true during the last one hundred years but historically. For me, all this brought to mind China's current problems. It seems public debt is handled or should we say, mishandled, in several ways. One example from the past was how Henry VIII, in addition to engaging in an epic debasement of the currency, seized all the catholic church's vast land holdings. While not strictly a bond default, such actions often accompanied by executions can still be considered as reneging on financial obligations. Call it what you wish but it is difficult to argue this doesn't constitute some kind of default. The varieties of economic crisis can even extend to Ponzi-type schemes that finally collapse in upon themselves creating contagion and resulting in a destructive domino effect. The massive derivatives market that is touted as one of our modern financial tools is often sighted as having the potential to wreck havoc in this way. It was also pointed out that countries involved in rapidly increasing trade often drove up prices for primary commodities. This tends to cause more investment and borrowing in that commodity which results in defaults when prices drop. Commodity price cycles have a way of destabilizing economies, this again creates a situation that translates into sovereign defaults when prices return to sustainable ranges. History shows some countries are simply crisis-prone and because of this they becoming "serial defaulters" who over-borrow when times are good which leaves them behind the eight-ball when a downturn occurs. Even the distinction of whether the debt was held internally by its citizens on externally by others did not alter the outcome and things still ended by default. The view that things are different this time is the reason they never are and seems to be the key as to why mankind continues to fall into the same kind of trap time and time again. Defaulting on debt and financial promises have become the norm as countries pass through the emerging market state of development followed by periods of high and extremely high inflation. This has almost become a rite of passage, even the United States endured an inflation rate in excess of 20 percent during the civil war in the 1860s. Some people think Asian countries have been able to avoid the kind of high inflation that has plagued the countries of South America and that they were able to avoid defaults until the late 1990s when the Asian financial crisis rattled the world. The fact is China experienced over 1500 percent inflation in 1947 and Indonesia over 900 percent in 1966. The Asian tigers of Singapore and Taiwan were hit by inflation well over 20 percent in the early 70s and Africa has even had worse luck avoiding this curse. Angola suffered inflation over 4,000 percent in 1996 and Zimbabwe's 66,000 percent inflation for 2007 put that country on track to surpass the Republic of the Congo. Some important lessons can be garnered from the book that elevated Reinhart and Rogoff as close to celebrity status as a couple of economists can ever come. By looking back at 800 years of financial history we see time and time again how high government debt ratios lead to slow economic growth. Overdone are the claims that governments all over the world have taken heed and downsized by adopting austerity measures costing millions upon millions of workers their jobs. Instead, we have seen deficit spending and borrowing surge as never before. It is safe to say everyone involved in shaping economic policy should own a copy of "This Time Is Different" and open it when things seem to be going well because the read brings with it a blast of badly needed seriousness and reality. Footnote; This is part one of a two-part series. The second part titled, "Don't Get Caught On The Wrong Side Of A Debt Default" will appear next week. Your comments are welcome and encouraged. If you have time please check out the archives for other posts that may be of interest to you. While the White House and many politicians in Washington are busy echoing President Obama's disdain for Russian President Vladimir Putin calling him a thug and a bully, across the water an important ally is busy meeting with Putin and forming closer ties. On December 12th Japan's trade minister reported his country's economic relations with Russia have grown more smoothly than political ties and about 30 joint projects are ready to be signed regardless of a breakthrough in territorial issues. Trade minister Hiroshige Seko said that a final decision on the projects is up to Prime Minister Shinzo Abe, who is meeting with Russian President Vladimir Putin in Japan. 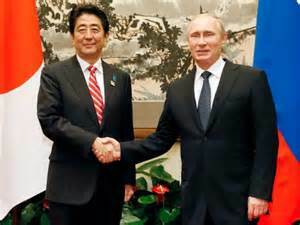 The new bonds being forged between Japan and Russia come after meetings late in the week, the leaders are expected to agree on an economic cooperation package worth some 300 billion yen ($2.5 billion), including private-sector projects such as joint mine development and loans for natural gas exploration. This all comes as Japan and Russia wrap up a summit aimed at making progress on a peace treaty to formally end World War II. The two countries still have unresolved issues over four islands off Japan's northern coast that were seized by the Soviet Union in 1945 in the closing days of the war. Abe said they had a "frank" exchange of views and although they announced no major progress, the two discussed ways to cooperate economically in the disputed area. Known as the Southern Kurils in Russia and the Northern Territories in Japan, the islands have prevented the two sides from fully putting the conflict behind them. The summit is the latest attempt to reach an agreement since Japan and the former Soviet Union began discussions in 1956. Putin, who is accomplished in the Japanese martial art of judo, has said he sees the lack of a peace treaty as an "anachronism" and wants to resolve the issue. Abe has looked to win concessions by dangling the prospect of major Japanese investment in front of Moscow, which is mired in economic crisis amid falling oil prices and Western sanctions over Crimea and Ukraine. The two leaders discussed working together on the economic development of the islands and ways to make it easier for Japanese former residents, whose average age is 81 to visit Japan. The two leaders called for experts to find ways to achieve joint exploitation of the territory, citing "fishing, tourism, culture, and medicine". Ironically, this is all taking place as America's leadership is actively engaged in vilifying Putin and raging against Russia and the new President elects views towards normalizing the relationship between the two nations. The recent revelations that some or even much of the news we see may be "fake" should not shock us. Much of what we hear and see put before us as news is not substantiated by real facts. This may be why many people have grown weary of the mainstream media constantly busy touting themselves as reliable reporters of a well grounded and honest portrayal of the world in which we live. 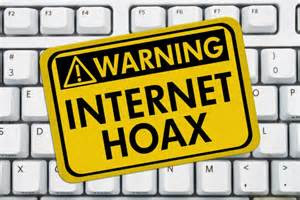 Most of us have had our heads turned at one time or another by news that we have found out is a hoax but more concerning are the bits of news that we believe that ultimately damage and mislead society. Ironically the false bastions of media honesty are not revealing some well-kept secret but merely rehashing what we have always known and desperately tried to forget. We are all pawns ruled by the money and influence of those calling the shots and guiding us into the future. This is not something that should bring comfort to any of us because this force is neither kind or benevolent. Making matters worse this is not a force that is well directed or necessarily competent. 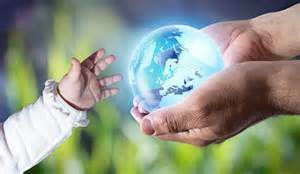 This is a force seldom focused on the goal of creating a better world but rather to promote its own self-serving interest. If in doubt remember the media is driven by ratings. Confirming that someone else has been less than forthright does not elevate institutions such as the Washington Post, the New York Times, or PBS to a higher level. One fact you can take as truth is that the news, media, and the internet have all become so polluted by bias, lies, opinion, and repeated falsehoods that nothing you see should be accepted as real. Adding to our woes is that many of the people within both the media and government are simply not that smart. This means they unwittingly spread mistruths like a virus. this is not the first time that I have railed against the propaganda being placed before us as well as the government overreaching and trying to shape our views. 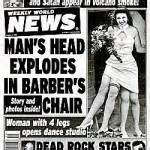 The fact that news is created in huge quantities and travels at the speed of light in our modern world only raises the need for people to become more skeptical and better informed. Some of the articles and stories presented to us as news is intentionally geared to mislead us and some are perpetuating falsehoods and myths we have been asked to accept. This gives us good reason to question the motives of those presenting the news, we should question the logic, and we should never give a pass to those claiming to be an expert. By not always looking deeper and peeking behind the curtain we do a great disservice to our country as well as ourselves and those we love. We often forget how lucky we are not to have been born into an area where life has turned ugly. A conflict often arises between "doing the right thing" and going along with the flow. Life is difficult for much of the world without starting down or being drawn down a path by someone who lets you down. Aleppo, Syria stands as a glaring example of how death and destruction can be spread through arrogance and proxy. Warfare has proven to be a pathetic option to bring about positive change, it may change things, but to what degree and for how long. The loss of life of an individual is often insignificant except to their loved ones. One of the harsh realities of modern war is that it has become a less personal way to die. Years ago it was hand to hand combat, looking into the eyes of your adversary, now you die by the hand of technology and often without any warning. Modern warfare is more abstract with many soldiers more emotionally detached from the carnage, we seem to want our soldiers trained on video games and placed on autopilot. The terms rebels or freedom fighters easily flows from our politician's mouths depending on which side they support or embrace. 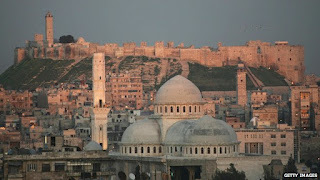 Aleppo is again proof of how for political gain politicians are willing to turn the masses into cannon fodder, that is what has happened to those unfortunate souls unlucky enough to have found themselves and their loved ones living in Syria during the last five years. Cannon fodder is defined as an informal, derogatory term for combatants who are regarded or treated as expendable in the face of enemy fire, in this case, it must be expanded to include all the residents of Aleppo and upon the hundreds and hundreds of thousands of unfortunate innocent souls who have died in the region. As this is being written Syrian government troops now control most of the neighborhoods and city of Aleppo after days of fierce fighting against rebel forces. This has been a bloodbath played out over years and has flashed across television screens everywhere. Only small pockets of the city remain in opposition hands and their days appear numbered. Basically, government troops are about to begin clean-up operations, a sanitized term meaning to kill off the last of the resisters and restore order. Anyone who knows me will testify that I'm far from a touchy-feely rollover and take it kind of guy opposed to war or to violence but you don't need to be a pacifist to rail at this kind of stupid widespread death and destruction. War tends to be a Pandora's box rather than the easy answer we often seek. Conflicts will always exist in our world and this again highlights the fact we must work towards developing a consensus of what is in man's best interest. Yes, we must defend ourselves, but the simple truth is most mothers value their children, the peasant in a rice patty field values his ox and neither desire to see them killed in a war. If we look at every war ever fought we will find that most of the people affected by the violence only wanted to be left alone. Though we live in an imperfect world mankind should not bring more misery upon himself by self-inflicting injury. While we remember and mourn for all of the heroes that keep dying for God and Country we should also remember it is always at the request of the latter. In the beginning of 2012, I wrote an article about Syria noting it was located in the troubled region of the world that includes countries like Egypt currently in political flux and undergoing social upheaval. Forces were busy lining up to supply weapons to both sides of the Syrian conflict fueling the fire and using the Syrian people as pawns in a very dangerous and deadly game. While noting the pressures building I also declared the Syria uprising has passed the tipping point where things could return to the way they were. Ironically I was right, however, it is not Assad that is gone it is all those who opposed him. Later that year in another article I told how the Red Cross had made it official and declared that Syria was now in civil war. I conceded the situation was indeed sad, very ugly and that no easy answers existed but that any programs that pour weapons into Syria risk escalating an already bad situation. More violence will desensitize the people and most likely destabilize the countries institutions, this will lead to a downward spiral and further violence. By September of 2013 after President Obama's red line was crossed few people realized the only real solution was to broker a deal breaking the nation into two parts. It was clear if Assad remained in power those who have suffered and been displaced would never forgive him and live under his rule, however, by demanding Assad be replaced they would create a new problem, a change in the ruling faction would most likely unleash a wave of killings, reprisals, and more instability. Borders are a creation of man and not visible to the birds flying above. Much bloodshed and many wars could be avoided if the issues of regime change or borders could be handled in a more rational and constructive way, but do not expect this to happen. Borders and political control is a problem that haunts man since before the written word. Recently President Obama and other officials have talked about the legal sanctity of sovereign borders, but in reality, this is an argument of convenience masking deeper issues. When it comes down to it we are just pawns in this sad power game. If you doubt this just ask some of the many people displaced from their homes in Syria. Sadly, the sweet idea of regime change has left the hands of President Obama and all those who advocated the overthrow of Bashar Al-Assad covered in blood. This statement may seem harsh because this is the kind of blood that can only be seen under the light of truthful scrutiny and close examination. Promises can be easily made, however, before doing so it would be wise to consider the ramifications of your actions. A greater degree of responsibility should be fostered upon those encouraging and supplying the weapons or war to those pondering a revolution. We can only speculate as to the full extent of America's responsibility. 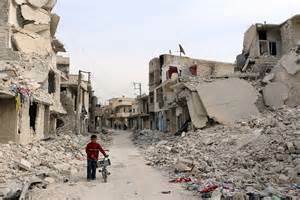 It was on August 20th, 2012 that Obama running as an anti-war president drew a red line in the sand stating how far Assad would be allowed to go before America would end his rule, this galvanized those opposed to Assad to take a stand. A strong case can be made that Obama's failure to stand by his word and our poorly focused foreign policy have led to massive death and destruction. This case becomes stronger when links are made to America supplying weapons and training to the group that eventually morphed into what we now call ISIS. Tomorrow Always Brings New Opportunities! Tomorrow always brings new opportunities! The question is, will you still be standing or in a position to take advantage of them? Last Thursday was a rough day for me in that I attended an auction to buy a piece of commercial property that I had a personal interest in. My father had owned this property and as a child, I had even lived there for a few years. 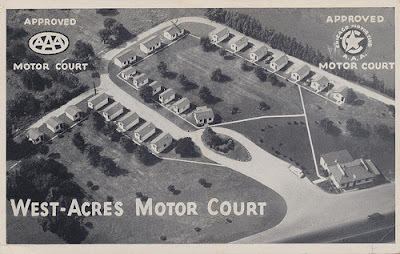 At the time it was a motel named West-Acres, it was the kind of place you see in the movies with little white cabins sitting along the road waiting for tired travelers needing a room for the night. This was before the interstate system was finished and people drove across America through its cities and towns. We lived in an area behind the office where the front desk was located. My father bought the motel around 1962 after the bank foreclosed on his life's dream, a modern new hotel praised as the finest in the city. After spending years building the project it failed and he was forced out. After that, he worked nights at International Harvester and ran the motel during the day. My mother and us kids manned the switchboard and ran the office when he was working his other job. 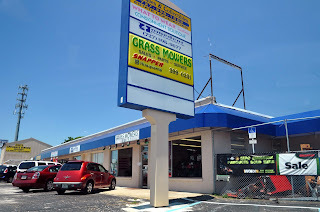 Within a few years, he opened a restaurant next to the office and we moved further back in the building, later he added two new buildings to what existed. My brother and I got our first taste of work helping to mow the six-acre lot, cleaning rooms, and trimming the vicious thorn covered barberry bushes that took every opportunity to draw blood. Clearly, in my developing years, the property made a mark on me. One of the more brutal task for a young kid was mixing mortar when the old man was laying the brick on the new buildings. I remember one cold day when we worked under a plastic covered scaffold as snow flurries fell, how he tolerated all our complaining and whining I will never know. Sadly, this turned out to be the reason I tended not to force my children into more forced labor as they grew up, this is one of my bigger regrets. I have become a firm believer that making a child do hard work builds character. Moving forward with this story, the property has long ceased to function as a hotel, land at the back was sold off, cabins were torn down, and a menagerie of businesses and storage units replaced its role of providing shelter as people demanded more amenities than it could provide. Also gone was the old weeping willow tree that provided the reed like switches that left welts on the back of our legs when we were caught up to no good and doing the things youngsters do. The threat of a lashing proved a strong incentive not to step out of line until we learned the threat was often worse than the actual pain. The owners had allowed this particular piece of property to fall into disrepair and it was politely referred to by the auctioneer as distressed. To say it was a "project" was a bit of an understatement, after years of having several utility meters not used they were pulled, several doors would no longer close and a water leak long ago in one of the buildings had damaged walls, ceilings, and floors leaving them covered in mold. Full of junk it was no bowl of cherries and represented a negative cash flow project that would require both a great deal of time and work as well as a lot of money to set right. Before I go any further with this story I would like to made it clear I'm not a big fan of auctions because they present too many variables when it comes to pricing. My thoughts on auctions can generally be summed up as "neither a seller nor buyer would I be." More often than not if my feet were held to a fire I would be a buyer but only if I did not value my time and enjoyed spending countless hours hanging out until the right moment arrived. Pricing a purchase on the spur of the moment without complete knowledge of what you are buying is seldom wise. The fact is competition at an auction tends to bring out the animal spirits in many people. This coupled with the fact that a fool and their money are soon parted joins together to form a dangerous combination. So, in summary, while disappointed that I was not able to purchase the property at my price the regret flows more from the time spent or wasted performing due diligence on a failed effort rather than from an actual feeling of losing a precious gem. When faced with not completing your mission, disheartened, or saddened I find it is best to chalk it up to fate and the idea it was not to be. It is usually a good idea to keep your powder dry. As an investor and businessman, it is best to consider such things as a mental exercise and practice for something better down the road and take solace in the fact you still have your money and probably avoided another mistake on the journey we call life. Italy is caught between a rock and a hard spot. 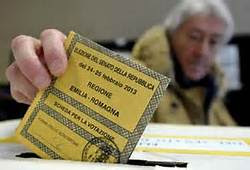 A lot is riding on just how certain forces react to Italy's vote and looming in the background is the possibility it might set in motion a series of events that could break apart the Euro-zone. Several key EU figures, such as European Commission President Jean-Claude Juncker and German Finance Minister Wolfgang Schaeuble, have tentatively backed the passage of the referendum indicating a "no" vote could lead to a destabilization of the entire bloc. Many economic watchers believe an altogether quieter crisis lurks at the top of the worry list, and that is Italy’s battle to prop up its debt-laden banks. As proof of their concern, we have only to look at the Central bank which has told Reuters the ECB is ready to temporarily step up purchases of Italian government bonds if the result of the referendum sharply drives up borrowing costs for Italy. In recent years the economic conditions have not been kind to Italy where unemployment stubbornly remains at 11% and living standards have barely grown since the country became a founder member of the single currency 15 years ago. Nine years after the onset of the financial crisis in 2007, output remains 8% down from its pre-crash level. Italy’s debt, the second-largest in the euro region as a percentage of GDP sits at a whopping 141%. As expected much of this is reflected in Italy's unhealthy banking sector. Adding to the countries woes is the migrant crisis that has worsened with time, every month 25,000 people now arrive on flimsy boats traveling across the Mediterranean Sea from North Africa. All opposition parties have lined up to denounce the constitutional reform, with some critics arguing that it strips Italy of vital democratic checks and balances currently in place. Matteo Salvini, head of Italy's Northern League a "no" vote is a "vote against the rules and regulations of Europe" adding that he felt Europe had let Italy down. imposing financial restrictions on its debt-ridden banks and providing little help over almost half a million migrants that had entered the country in the past three years. Yet while opinion polls in a survey in the newspaper La Stampa recently indicated that 71 percent of Italians think leaving the euro would make the country’s economy worse rather than better. Eight years after the start of the global financial crisis when the UK’s banking meltdown was marked by the queues of panicking customers outside bank branches Italy is facing decisions that will shape not just the future of the Italian banking system but that of the banking system throughout Europe. Non-performing loans (NPLs), those on which customers’ repayments have fallen behind remain a problem. Banks across Europe's index of shares for 600 European banks is down 22% so far. But Italy’s bank stock index is down 35%, with its biggest bank down 40%. Italy has more than 500 banks, and more branches than restaurants lay scattered across the county. They are weighed down by €360bn (£305bn) of bad debts. These create a heavy cost that hangs over them at a time when revenues are under intense pressure since the ECB has cut rates to zero. All this creates a rather complex situation and driving wealth out of Italy. As far-fetched as the thought Italy would follow the U.K.'s example and leave the European Union may seem, capital flows suggest that some people aren’t waiting to find out. Europe's central banks track flows of money among the members of the currency union. 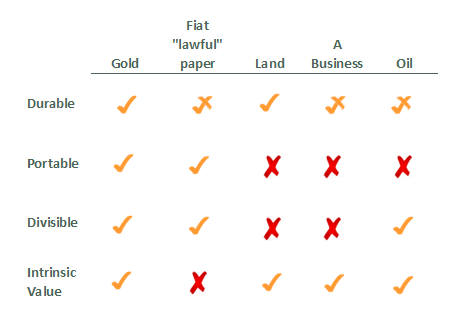 If, for example, a depositor moves 100 euros from Italy to Germany, the Bank of Italy records a liability to the Eurosystem and the Bundesbank records a credit. If a central bank starts building up liabilities rapidly, that tends to be a sign of capital flight. Lately, Italy's central bank has been building up a lot of liabilities to the Eurosystem. As of the end of September, they stood at about 354 billion euros, up 78 billion since the end of May. The outflow isn't quite as large as during the sovereign-debt crisis of 2012, but it's still significant. The main beneficiary is, of course, Germany, which has seen its credits to the Eurosystem increase by 160 billion over the past year. People are clearly worried about the state of the country's banks, which are suffering the consequences of bad lending, poor governance and a new euro-area oversight system that makes rescues difficult. Another is political: Italian Prime Minister Matteo Renzi has staked his fate on a December government-reform referendum that, if it goes against him, could strengthen opponents who want to force a vote on whether Italy should remain in the common currency, a key element of the broader union. In that context, it's not surprising that some depositors prefer not to hold Italian euros, given the chance that they might eventually be converted into lira. Either way, the capital flight doesn’t speak well of confidence in the European project. This is something EU leaders will have to keep in mind as they negotiate the terms of Britain's exit. Austria is the first EU nation to hold a presidential election and face this growing populist sentiment since Trump's surprise victory in the United States. This means both the votes in Austria and Italy are also being viewed as a test of the momentum behind the people's revolt that has led to Donald Trump's presidential win and the historic British vote to leave the European Union. Anxieties over immigration, security and the economy have created vast support for anti-establishment parties and nationalist movements in Europe, the United States and across the world. French President François Hollande, whose popularity has plummeted announced he will not seek re-election next year, saying he wants to give his Socialist party a chance “against conservatism and, worse still, extremism.” The events taking place on the world stage are indeed far from dull. It is very important to understand and keep the concept of debt before us because such a great deal of our economic system is about debt. It has become the main driver of both the American and global economy. 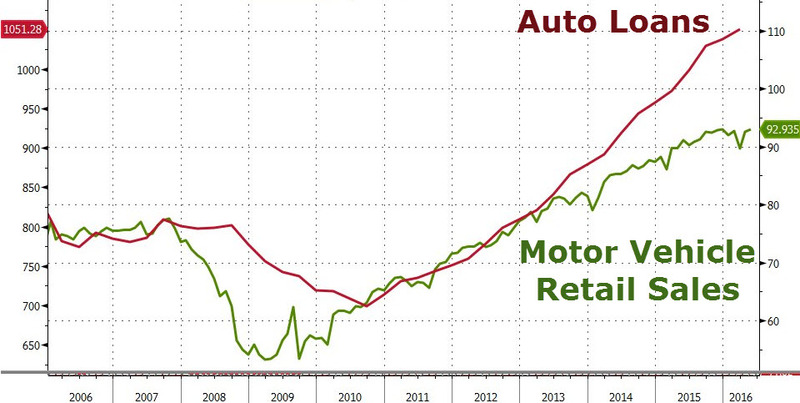 For a long time I have had a problem as economist and others pointing to the auto industry as proof the American economy is on the mend. Today in America we see a land where even unemployed students are buying new cars. Claims that the auto market is hitting on all cylinders is a simplification of the situation and not giving enough focus as to where the sales are coming from. The facts behind what is pushing this market forward are very disturbing. This unsustainable trend in new car sales is being created by the combination of lower rates, loosening underwriting standards and voracious demand for new securitizations by Wall Street and pension funds that will do just about anything for an extra 25bps of yield. A large number of auto loans this year were to subprime borrowers. Subprime loans now account for 36.5% of all outstanding auto loans. The main reason lenders are willing to write these notes is because they are often able to charge these high-risk borrowers more than double what prime borrowers pay, subprime loans can be very profitable for lenders if borrowers do not default. Average rates for subprime loans were 10.36% in the fourth quarter of 2015, for deep subprime borrowers, rates averaged 13.31%, this is at a time when new car buyers with excellent credit paid 2.7% interest. Artificially low-interest rates have sucked yield-thirsty pension funds to purchase every subprime auto securitization they can get their hands on as they ignore the massive auto loan bubble waiting to pop. The latest report from Edmunds reports that 32% of trade-ins having an average negative equity balance of $4,832. This means many of these buyers are simply rolling that negative equity into a brand new 7-year loan at a 2% interest rate. The amount of negative equity car buyers are rolling has also reached a record high confirming these shoppers are not deterred to absorb a significant financial hit in order to get into a newer vehicle. Another concerning part of this report is that the percentage of used cars being traded in with negative equity values also continues to spike and currently stands at an all-time high 25% with the average balance of the negative equity also, continuing to rise to $3,635 for Q3 2016, up from roughly $2,750 in Q3 2011. 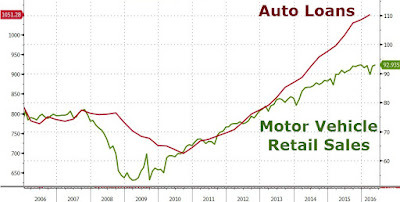 This is not just about auto loans, the debt bubble forming extends to many sectors of our economy. The average student loan debt is now $33,000. Until the Obama administration went Keynesian much of student loan debt was primarily held in the private sector. When Obama entered the White House total student loan debt was $620 billion and delinquencies totaled $50 billion. There are now $1.3 trillion of student loans outstanding, with the Federal government accounting for $830 billion and guaranteeing a large portion of the rest. Delinquencies have skyrocketed to $125 billion and these loans are not aging well. Going forward it is clear another taxpayer bailout is in the cards or someone will be forced to take massive write-downs. While I have focused on student and auto loans I'm aware this subprime buying binge has broadly spread to a wide range of consumers. Is was best said by someone who wrote: "Only a University of Phoenix, African Studies major is more of a subprime risk than the millions of ecstatic Escalade drivers cruising around our urban ghetto paradises." The Federal Reserve has been pumping in trillions of dollars of liquidity into the economy and much of it has resulted in pulling future consumption forward. These policies will soon become a headwind to both future sales and growth. This creates future problems and is more proof of just what an infusion of money from the Fed can produce and how it distorts economic reality. The basis of such an economy is unsustainable and because it has been able to exist for so long does not mean it can continue. It is important to remember not all debt is created equal. A mirage is a naturally occurring optical phenomenon in which light rays are bent to produce a displaced image of distant objects. Joining the idea of a mirage and contagion with the reality of collapsing debt forms an interesting subject. It is important to remember all debts and obligations do not come due at the same time. Also, it must be noted when a bill is not paid or defaults it often starts a long and drawn out legal battle, this collection process that may extend years without harsh consequences. This, my friends, is the reality of modern life in America and much of the world, debt will always be kicked down the road and this is a good reason not to be the lender when reality hits.